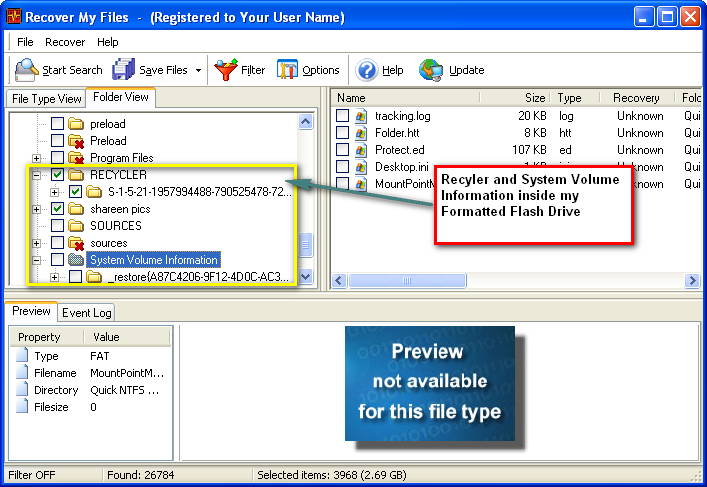 Recycler virus doesn’t only infect fixed drives of your computer but also your removable storage or Flash Drives. The Recycler virus could be transferred from one computer to another via Flash Drives triggered by Autorun.inf. Recycler virus simply collects your deleted computer files and more seriously disable your System Restore then makes your computer freeze every day until it becomes unusable. Lately I suspect that Recycler Virus and System Volume Information is the most cause why our Flash Drives or Removable storage fails result to corrupt data, write protected problems, IO error, space problem and other related issue. I have a 2 GB Kingston Flash Drive before it works fine I can store almost 2GB of files as its capacity but until one day Recycler Virus hit my Flash Drive when my friend borrow it to transfer files then all of my files becomes corrupt. I run a recovery software to see other missing files and guys, I was shock Recycler virus is dominating my Flash Drive. I check properly all the files of Recycler virus and I found 3 files and to tell you more, the one RECYCLER virus files is 21 GB. Oh! How come my USB would not fail because the capacity of my Flash Drive is only 2GB and that stupid Recycler virus is 21 GB? Honestly, my Flash Drive until now doesn’t work well like before due to Recycler virus. It can only accept 200 mb of files and if add more it will result to corrupt data and IO error. Some of my friends in Davao also consulted me about their flash drive problems with the same situation to my experiences then I did the same steps to verify and it’s positive I found the same stuff, the Recycler virus. Except for those fake flash drives and mishandling could also be a cause to fail but Recycler virus is different in the sense that it can even own your computer. You didn’t know that? Just read my next revelation about Recycler virus.